THE FOUR REMAINING members of the leadership of the brutal Khmer Rouge regime have gone on trial in Cambodia. 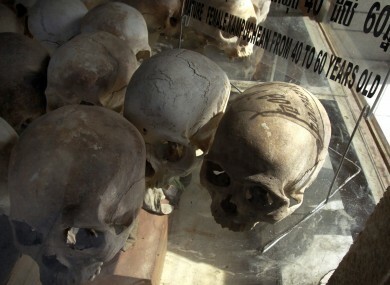 The Khmer Rouge reigned in the country from 1975 to 1979 under the leadership of Pol Pot. 1970: a coup is staged by US backed Marshal Lon Nol, forcing Sihanouk out of power. Sihanouk is aligned with the Khmer Rouge, a Maoist guerrilla group. 1997: Pol Pot is put on trial by the Khmer Rouge and he is sentenced to life imprisonment. Deputy leader of the Khmer Rouge had been allowed to form a new party. 1998: The Khmer Rouge’s last stronghold falls to Cambodian forces. In April 1998 Pol Pot dies in a jungle hideout. Email “Khmer Rouge: A timeline”. Feedback on “Khmer Rouge: A timeline”.